Since launching our Chrome Lead Clipper extension, we’ve received a great response from our customers. Thanks to this feedback, we’ve further enhanced the clipper’s existing features of lead capturing for Gmail by adding the ability to clip leads directly from Twitter. Twitter is a fantastic social network and is ideal for lead generation, particularly for B2B sales. It allows you to check out the profiles of potential leads, to help qualify them and decide if they’re suitable for your business. 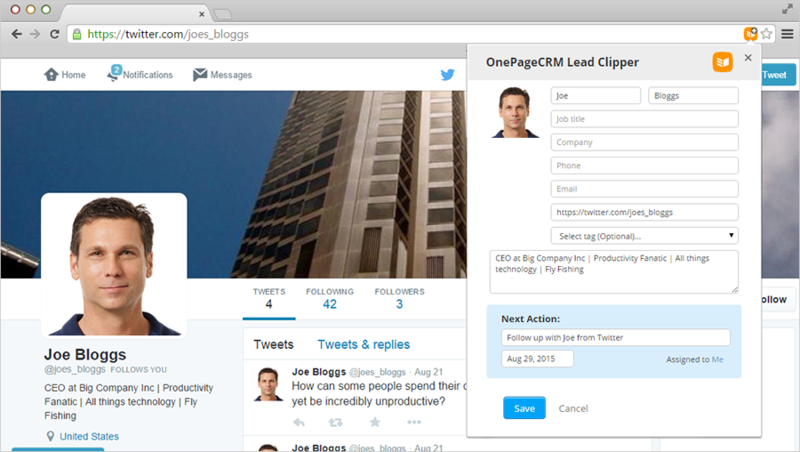 You can quickly clip their contact details, along with profile picture and background into OnePageCRM. If you’re already familiar with using our Lead Clipper for Gmail then you’re set to go straight away, nothing else has changed! If you need some help getting set up, check out our help site. 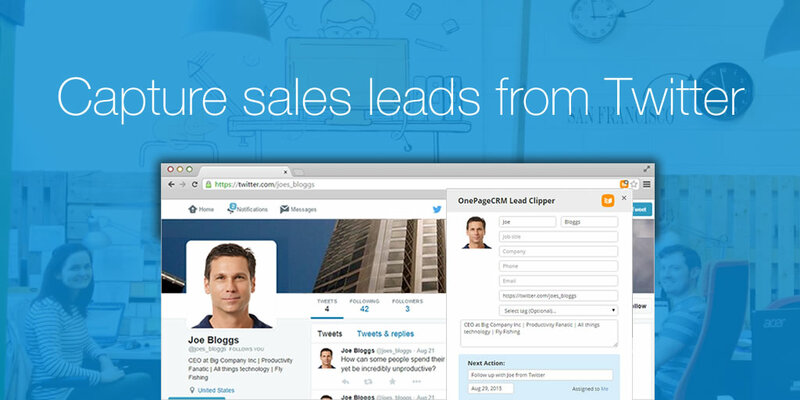 We’ve also added some new functionality to our existing Lead Clipper to make your lead capture even more complete. And as usual, you only need to click save, to send them straight to OnePageCRM! Keep your feedback coming and let me know how you like our latest updates. We love to hear our customers thoughts and experiences with OnePageCRM – so comment, Tweet or email me at brianm@onepagecrm.com. Interested to see how our Next Action Sales method and the Chrome Extension can help you close more sales? Download now!